If you weren't already excited about Jurassic World: Fallen Kingdom, this might just do the trick. We haven't seen Jeff Goldblum as Dr. Ian Malcolm since The Lost World: Jurassic Park, which was released more than 20 years ago. So the fact that he's coming back to the franchise after all of this time is exciting. Now, we have our very first look at Goldblum's return to the Jurassic Park franchise, and it's perfect. Our first look at Jeff Goldblum's return as Dr. Ian Malcolm comes via a newly released behind-the-scenes featurette for Jurassic World: Fallen Kingdom. The featurette combines a lot of behind-the-scenes interviews and footage, blended with choice bits of new footage from the movie itself. About halfway through, there's a shot of what looks to be a rather large courtroom and, sitting at one of the tables is none other than Ian Malcolm. A lot of time has passed since we last saw the fan-favorite chaotician, but this looks very much like the Dr. Ian Malcolm fans know and love. He's just traded in his signature leather jacket for a slick black suit. But he still looks smooth as ever and the one line of dialogue he speaks in this video promises that his character hasn't changed much either. He still thinks mixing humans and dinosaurs is a bad idea. "Here I am talking about dinosaurs again." How exactly Ian Malcolm fits into the story of Jurassic World 2, which arrives in theaters on June 22, 2018, is still a mystery. Maybe he's going to give his opinion on how to handle the animals in court as someone who's witnessed them first hand? We do know that his role in the movie will be relatively small, but likely significant. Given the events of Jurassic World, and that we know this new movie is going to involve rescuing the dinosaurs of Isla Nublar from a volcanic eruption, we can assume Malcolm will have strong opinions on the matter. Director J.A. Bayona said in a recent interview that having him in the movie and on set was very impactful. "I had to overcome the impact of being in front of Ian Malcolm. After so many years, Jeff Goldblum was in front of a camera again talking about dinosaurs!" We're sure to see a little more of Jeff Goldblum in the first full trailer for Jurassic World: Fallen Kingdom, which is set to debut tomorrow during Thursday Night Football. Keep your eyes peeled, as we'll be sure to bring you the trailer the second it's made available online. 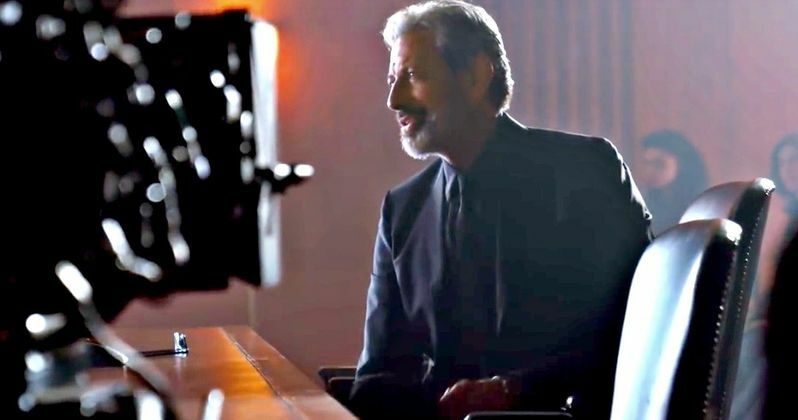 In the meantime, be sure to check out the first images of Jeff Goldblum as Dr. Ian Malcolm in Jurassic World: Fallen Kingdom for yourself below and, if you haven't already, check out the featurette, courtesy of Universal Pictures.